There are a number of field guide series available. Books within these series cover many natural history subjects. Here are some of the popular field guide series, including series aimed at children with pertinant titles listed beneath each. Toward the end of this list are some individual field guides of interest. These pocket-sized books have been used by adults and children for many years. Over 30 titles are in the series. Here is a sampling. These pocket-sized booklets of about 30 pages each include excellent black and white line drawings of southwest desert animals and a short description of each. Each title begins with "North American"
There are over 50 titles in this popular series. National Audubon First Field Guides (New York: Scholastic, Incorporated). Peterson Field Guides for Young Naturalists (Boston: Houghton Mifflin). 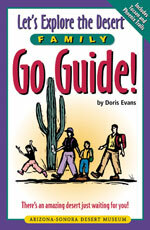 These guides are not specific to the southwest. 1997 Simon and Schuster's Guide to Insects and Spiders. New York: Simon and Schuster. Large photographs, clear descriptions, easy use of classification, and good introductory information. 1997 Field Guide to Birds of the Desert Southwest. Houston: Gulf Publishing Company. 1990 Cacti of the Southwest. Bisbee, AZ: Tortilla Press. 1995 A Field Guide to the Plants of Arizona. Helena, MT: Falcon Publishing, Incorporated. 1998 Field Guide to Mammal Tracking in North America. Boulder, CO: Johnson Books. 1999 A Field Guide to Desert Holes. Tucson: Arizona-Sonora Desert Museum Press. 1983 Birds of North America. New York: Golden Books Publishing Company. 1998 Animal Tracks of Arizona and New Mexico. Renton, WA: Lone Pine Publishing Company. 1990 Reptiles and Amphibians of North America. New York: Golden Books Publishing Company. 1990 Animal Tracks of the Southwest States. Seattle: The Mountaineers. 1974 Desert Tree Finder. Berkeley: Nature Study Guild. An easy key for identifying desert trees, yuccas, and cactus.